Here’s another fun room photographed by Hiya Papaya in a recent home show. I think there’s a good chance that one of the reasons this room caught my eye was that is shares some similarities with my guy Isaac’s new room. I like the farmhouse vibe combined with bright colors and bold, modern graphic patterns in the bedding. I looked around to find five examples of similar design details that other bloggers have DIYed. 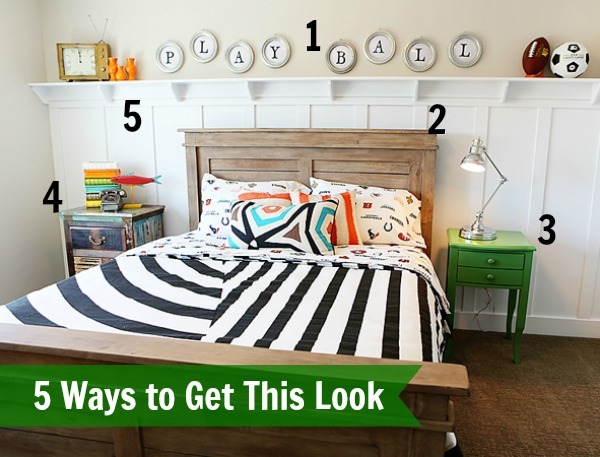 Check out these ideas for getting this look for budget prices.